Tickle Ur Fancy set a new track record for 400 yards at Portland Meadows on Sunday. PORTLAND, OR-JANUARY 28, 2018-Picking up his third consecutive win of the meet, multiple stakes winner Tickle Ur Fancy drew-off Sunday afternoon to win the $12,850 Mount Hood Handicap (not black type) by 1-� lengths while establishing a new track record for 400 yards at Portland Meadows. Ridden by jockey Eduardo Gutierrez-Sosa, Tickle Ur Fancy completed the 400 yards in :19.744 seconds, a 107-speed index over a "wet fast" surface with a 3-mph crosswind. The previous record of :19.749 seconds was set November 10, 2013 by Flyin Lion. Trainer Hector Magallanes conditions the 5-year-old daughter of multiple Grade 1 sire DOMINYUN for Hayden Brothers Ranch. Bred in Oklahoma by Bobby D. Cox, from the First Down Dash mare Sizzling Lola, Tickle Ur Fancy has compiled a (20) 12-3-1 record and today's winning purse of $6,425 boosted her earnings total to $82,955. A solid stakes performer from the beginning of her career, Tickle Ur Fancy has won the Pot O'Gold Futurity and Portland Meadows Championship Bonus Challenge, was second in the Wild West Futurity and Portland Meadows Winter Derby and third in the Jack Rhoden Memorial Bonus Challenge. Silvies, a Mitey Jody mare owned-and-trained by Silvestre Sanguino, picked up $3,213 for second. Hayden Brothers Ranch bred the chestnut mare in Oregon from the Kipas Special mare Termination Point. Ridden by Robert Burney she has earned $36,147. Connie Chumbley's Sneakin Tr as a neck back in the show position for trainer Scott Raley. 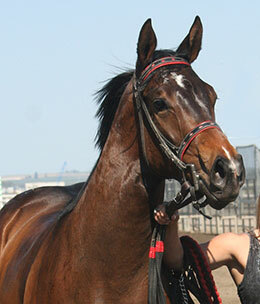 Gary Chumbley bred the Tr Dasher gelding in Oregon from the Splash Bac mare Sneak Bac. Ridden by Kassie Guglielmino, Sneakin Tr picked $1,607 to boost his bank account to $47,728. L Bar D Genuine Red and Henry Craig completed the field. L Bar D Bonnie Lee was scratched.